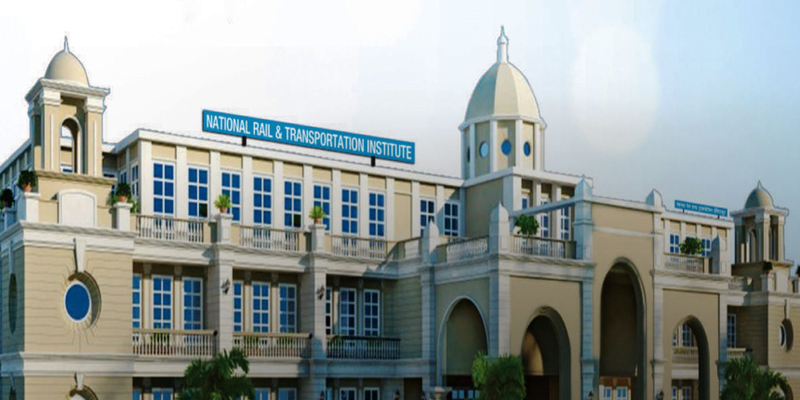 NRTU Admission 2019 - The National Rail Transportation Institute will release the notification for NRTU 2019 Admission by June 2019. NRTU Admission 2019 will be conducted with the release of the application form by the first week of July 2019. The National Rail Transportation Institute conducts admissions to the BSc in Transportation Technology and BBA in Transportation Management courses offered. Candidates who have completed their 10+12 in the science stream with mathematics as a compulsory subject can apply for the courses. NRTU 2019 Admission will be conducted based on the marks scored by candidates in the qualifying class 12 examination and the scores of the aptitude test. The Admission of NRTU 2019 will be conducted based on an aptitude test which will be conducted for a total duration of 90 minutes (1 hour 30 minutes). The admit card for the aptitude test will be available online for download from the second to third week of July 2019. The aptitude test will be held in the computer based mode in the third week of July 2019. Candidates have to answer 100 multiple choice questions which will be divided across four sections. Read more to check the detailed exam pattern, eligibility criteria and application process for NRTU 2019 Admission. As per NRTI, candidates who wish to apply for the B.Sc and BBA programmes must have completed their class 12 qualifying examination in the science stream with mathematics as a compulsory subject. NRTI will conduct the aptitude test in the third week of July 2019 in the computer based mode for a duration of 90 minutes. Candidates will have to answer a total 100 questions divided into 4 sections. Every correct answer will be rewarded with 1 mark while for every incorrect answer 0.33 marks will be deducted. The questions for the NRTU Aptitude Test 2019 will be based on English Proficiency, Reasoning and General Intelligence, Quantitative and Numerical Ability and General Awareness. The specific topics and sub-topics included in each of the sections are given here. Recognizing grammatical structure and usage. Using prepositions, determiners, connectives, tenses appropriately. Mountain, River, Soil, Population, Natural resources, etc. Indian Culture, Dance, Art, Music, etc. NRTI will release sample papers online for candidates to prepare themselves for the aptitude test. The sample papers will help candidates to understand the exam paper better and practice for the examination. The sample papers will also help candidates to understand the types of questions that could be asked for the aptitude test. Understanding the exam pattern for NRTU aptitude test is the first step to prepare for the examination. The question paper will be divided into four sections with each of them having different number of questions. Candidates can prioritise the sections based on this. The syllabus of NRTU 2019 contain the different topics and subtopics in each section based on which the question paper will be set for the examination. Since you have an idea about the exam pattern and the syllabus for the examination the next step is to prepare a time-table giving time for each and every topic specified in the syllabus. Once you go through the syllabus you will have an idea about the topics which you are familiar with and easy to study along with the tougher topics which will need more time. NRTI provides sample papers which will help candidates in preparing for the examination. Solving sample papers will help candidates to understand their subject knowledge which can also help in further preparations before the examination. The counselling process for NRTU admission 2019 will be conducted after the results of NRTU are released in the second week of August 2019. The counselling will be conducted in the University Campus, Vadodara. The counselling for candidates in the first merit list will be conducted in the third week of August 2019. Candidates must make sure to carry the following documents to the counselling process. Six recent coloured passport size photographs of the candidate in formal dress. Your NRTI Admission Aptitude Test brochure has been successfully mailed to your registered email id .